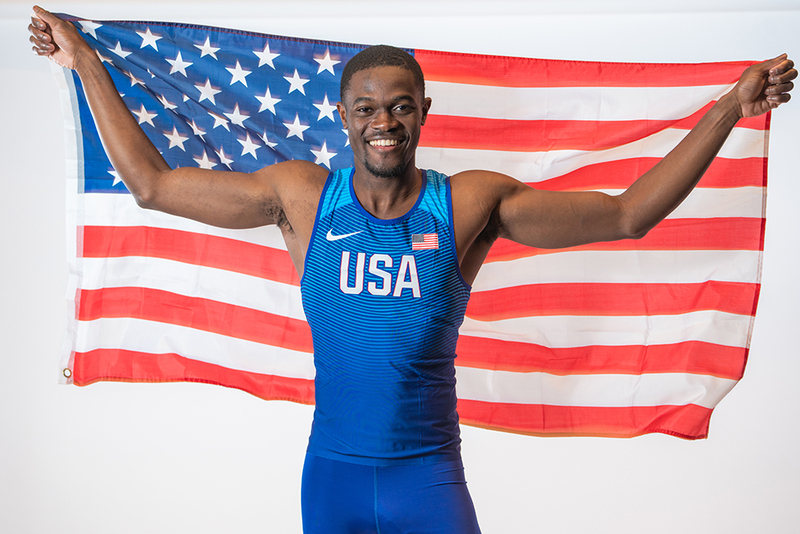 Now cleared by the IAAF to run for the nation of his birth, Rai Benjamin looks forward to representing Team USA this year. A recent tweet quoting Rai Benjamin, the 21-year-old Collegiate Record holder who is history’s equal third-fastest 400 hurdler, summed up an end and a beginning, the final curtain on a bureaucratic holding pattern, for Benjamin’s transfer of allegiance from Antigua to the U.S. and the go signal for his life as a professional athlete. Start line, indeed. Benjamin’s prospects as the starter’s pistol cracks for his pro career stir the blood of Stateside fans. He’s 100% American now in the eyes of officialdom and cleared to compete in the colors of Team USA. 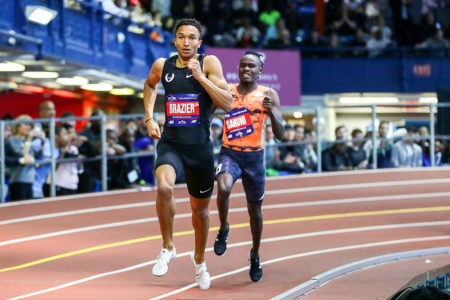 Although both ran in Paris last year—Benjamin’s 200 PR coming in the same meet as Samba’s 46.98—Samba and Benjamin have never clashed, and if they’re to hook up on this year’s DL Circuit, the first opportunity would be Shanghai on May 18. 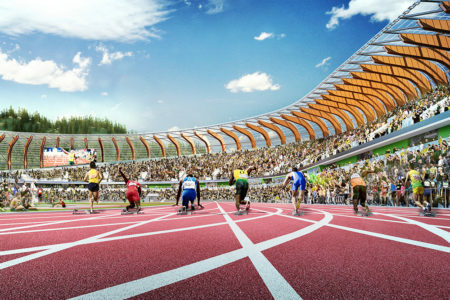 The other DL meets with men’s 400H comps are Stockholm (May 30), Oslo (June 13), Stanford (June 29), Birmingham (August 18) and the final in Zürich (August 29), with the interval to the Doha heats (September 27) nearly a full month. As fans chew the fat about the year’s prospects—this happens at meets, on social media and message boards, and occasionally over a beer—it is often suggested that Samba, No. 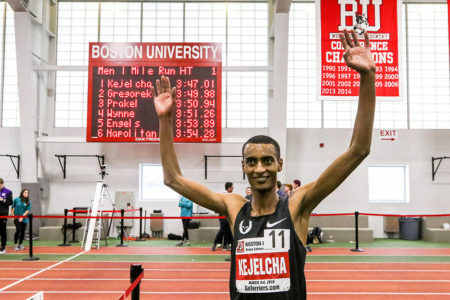 2 on the all-time list, and Benjamin might push each other into World Record territory. But it is important to bear in mind that peak 400H marks are rarely approached more than once in a season. WR holder Kevin Young produced his pre-record best, 47.63, in the semis just a day before his standard smasher in the Barcelona Olympics. When Edwin Moses, the last 400 hurdler to break the record more than once, first took the mark into sub-47.20 territory (47.13 in ’80), he cut an even half-second from his prior best. When Samuel Matete, No. 5 on the ATL, hit his 47.10 PR in ’91, the occasion marked an 0.6 chop from his fastest time before that. May We See Your Passport Please? 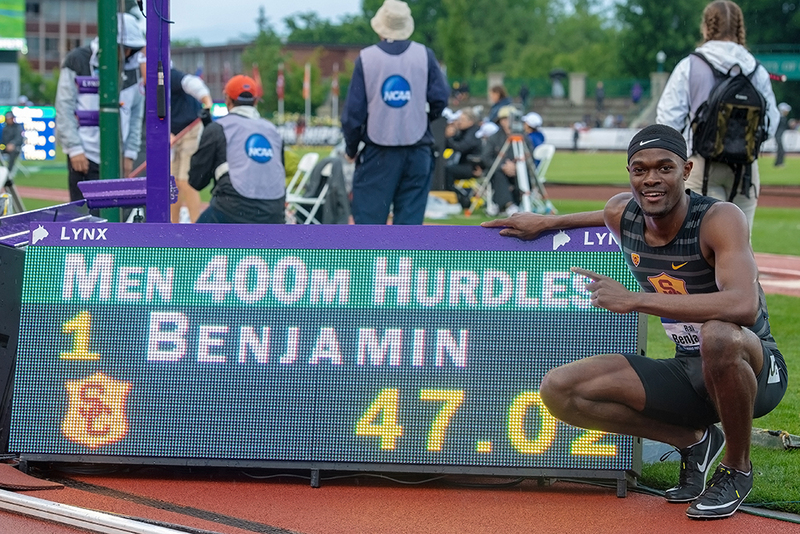 New York-born Rai Benjamin, who was part of three Collegiate Records (indoor 4×4, 400 hurdles, outdoor 4×4) in his junior season at USC, has always looked upon himself as American even though he did represent his parents’ native Antigua at the ’13 World Youth (U18) Champs and ’15 World Relays. 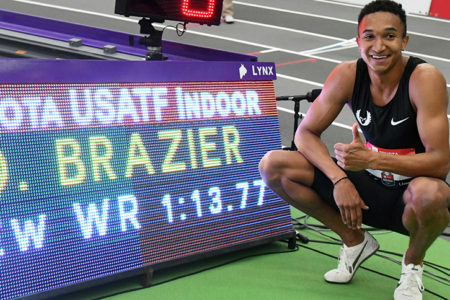 He felt sure the IAAF would approve his switch to a U.S. affiliation, although the federation’s temporary moratorium on transfers in ’17 and last year infused some uncertainty about timing. 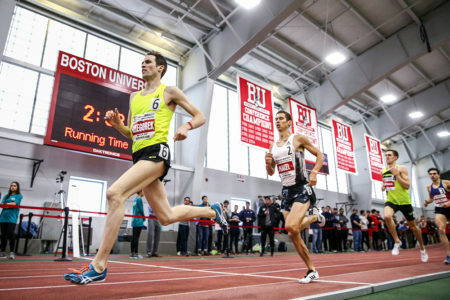 As a first-year Nike pro—as is well known, he is foregoing the ’19 collegiate season—Benjamin is training in familiar surroundings on the practice oval where he reaped fitness last year. Joanna Hayes, having resigned her position as a USC assistant, serves as his coach of record, but the rest of the Trojan staff that guided Benjamin remain in his corner as well. “Yeah, they all are going to be doing the same thing,” he says. “During the fall they all were out at practice. Coach [Quincy] Watts is very much a stickler on technique as well as Coach Caryl, and Coach Hayes is a facilitator. She is amazing on technique and paying attention to detail and stuff like that. 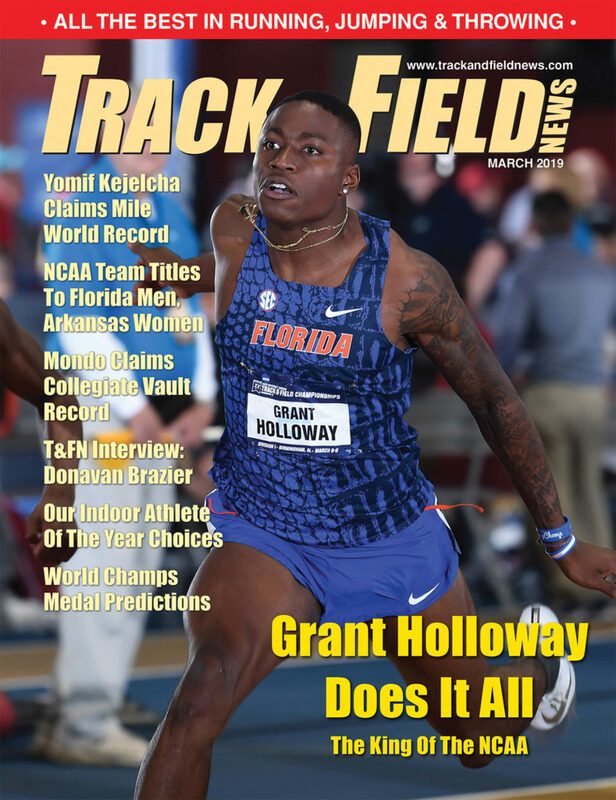 So they all play their part in giving something to each and every one of us in the group.” Said group consists of Benjamin, 400 CR-setter Michael Norman, women’s indoor 400 CR-setter Kendall Ellis plus Trojan alums Aleec Harris, Beejay Lee and Ricky Morgan. Benjamin’s foot sprain last season slipped mostly beneath the public radar and affected a foot he had fractured in ’16, his first collegiate season at UCLA, SC’s crosstown rival. That break, he allows, declining to offer details, resulted from “just being stupid and being a freshman in college.” Lingering weakness in the injured extremity came up to bite him in his first hurdle practice of ’18. “I hurt it and it was definitely hard to practice. I had to sit out for a week or two and it was just hard to get back into that motion, get back into that rhythm.” Benjamin stepped out for his second hurdles meet of the year at the Pac-12 and ran a 49.84 heat, 12-stepping part of the way to his own great surprise before dropping a 48.46 final. “I was in so much pain at Pac-12s,” Benjamin says, “I couldn’t even describe it. It hurt a lot. I had my foot wrapped the entire time. That’s why we didn’t run the 4×4 and why we didn’t close out the meet. Pac-12s was a rough meet for all of us [USC athletes], in all honesty. Everyone was pretty banged up. Benjamin’s hurdle training for the year, he says, “was very minimal. Before Pac-12s I think I had like a week, just one week, where I hurdled one time and Coach Hayes set up the little plastic hurdles on the lowest setting ever and I was basically just walking over them at practice. It was frustrating because I know this isn’t going to help but I don’t have a choice because my foot hurts a lot. I ended up sucking it up again and finally hurdling at [the USC–UCLA dual] and opened up at a 49-high. That was frustrating because what I was doing in practice, my fitness level, didn’t translate to 49-high, but it was also a dual meet and it wasn’t that demanding. Where in the world, then, did the 47.02 come from? “Our base training was pretty good,” Benjamin says. “I ended up doing a lot of grass runs. I’d bounce back and forth between Coach Watts and Coach Hayes and sometimes Coach Caryl. When I couldn’t hurdle I was always with Coach Watts so I was doing a lot of quartermile work, a lot of volume stuff like that. So he really facilitated me keeping my fitness at a certain level. And also having Michael Norman at practice.” When the coaches let the two stars run alongside each other. Process all that, pray that Benjamin stays healthy in ’19, and sit back and wait. A mind-bending year in the 400 hurdles may be coming right up.